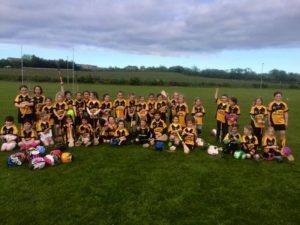 Well done to our nearly 40 crew of U8s who welcomed Glynn/Barntown for a practice game this evening in Hollymount…the future of the club looks bright!! Good luck to Simon Donohoe and the Wexford hurlers and Wexford camogie team today Sunday 25th February in Wexford park, throw in Hurling at 2pm, Camogie at 3.45. Tipperary 0-16 Wexford 2-11. Unbelievable finish to the match yesterday. Tipp were in the driving seat for most of the game, but Wexford with the ‘never say die’ attitude and a little bit of magic got the win. Again, it was Una Leacy grabbing a great goal and Kate firing over frees and points from play. Three great saves from Mags Darcy, a hook from Sarah OConnor, a little grab of the sliotar off a Tipp hurl by Kate. Catches from Katrina Parrock, a broken ball from Una for Emma Walsh to finish to the net … The list goes on, but at the end of today, Wexford’s All Ireland journey still goes on and we live to fight another day. There was a very good wexford attendance in Walsh Park and they willed the players to finish strongly. The crowd vocally got behind the team to give them a massive lift when the hard ground and the heat had worn the players down! Best of luck to St Ibars/Shelmalier senior camogie team today in the county semi final vs. Oulart @ 1:45 in Bellefield. All in the Shelmalier club would like to wish our camogie players the best of luck in their Co. semi final against All Ireland champions Oulart/The Ballagh in Bellefield on Sat next 10th Oct.
A big attendance from the parish is expected to travel to Bellefield to cheer on the girls. on Wexford’s 3-17 to 0-10 loss to Galway in the All-Ireland Under-16 ‘A’ championships semi-final in Edenderry on Sunday last. Shauna played at centre-forward, while Jessie was brought on. Friday, Aug 22nd Junior C championship away to Ferns St Aidan’s @ 7.30 pm, also Under 12 mini-league finals in Hollymount.